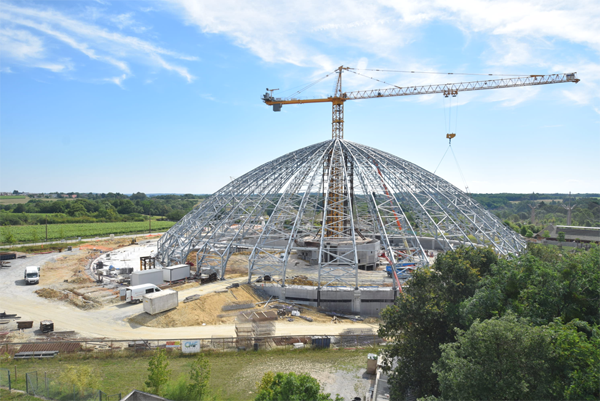 A Potain MD 689 M40 top-slewing crane is helping to construct the new ‘BioDome’ in the famous ZooParc de Beauval in Saint-Aignan-sur-Cher, France. The MD 689 M40, the biggest of the Potain MD range, was installed in March 2018 and is now nearing the end of the project; dismantling is planned for February 2019. The model installed for this site features a 60m jib and can lift up to 40t. Contractor CMF Groupe chose the MD 689 M40 due to its ability to handle high capacities and durability when tackling long-lasting jobs. When complete, the BioDome will accommodate 3,000 visitors and house Komodo dragons, hippos and manatees.